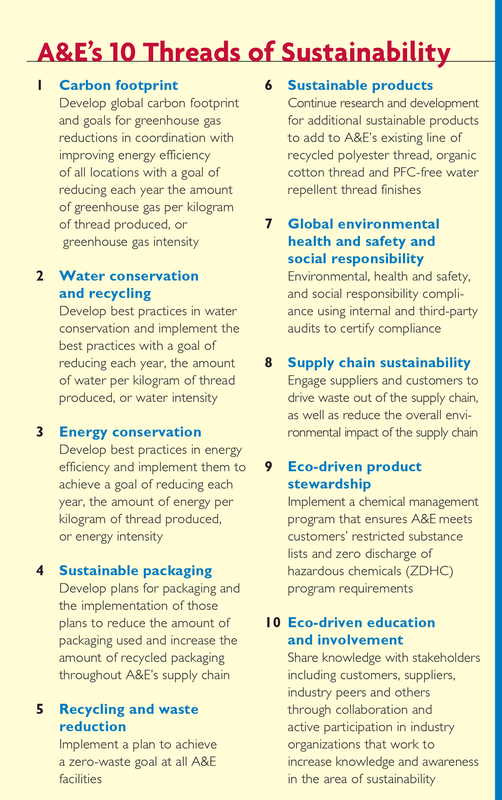 A&E — a leading producer of sewing thread, embroidery thread and technical textiles — has recycled and reused more than 1.1 billion liters of wastewater since 2013, and 16 operations and support facilities have achieved 100 percent zero-waste-to-landfill status. The landmark National Environmental Policy Act of 1969 (NEPA) made it U.S. policy to better protect the environment and promote sustainability. To achieve this laudable goal, virtually everyone must participate — companies, consumers, state and local governments and institutions. Proudly, the U.S. textile industry has been a pacesetter in this important area by routinely exceeding government mandates. 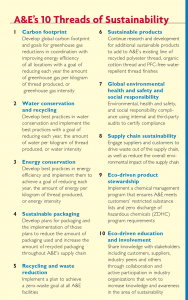 Albert Einstein once said, “We cannot solve our problems with the same thinking we used when we created them.” This commitment to a new way of thinking is why many U.S. textile companies have altered production methodologies, adopted sophisticated recycling programs and instituted zero net waste policies to ensure the protection of our environment and natural resources. Two that stand out are American & Efird LLC (A&E), and the Jones Family of Companies. Founded in 1891, Mount Holly, North Carolina-based A&E is a global company and among the world’s foremost manufacturers of sewing thread, embroidery thread and technical textiles. Summers noted that the company maintains a program called “The Ten Threads of Sustainability.” Each thread addresses an area of environmental responsibility and outlines A&E’s commitment. A&E views this as a journey and not a destination, and while it has made some significant progress, the objective is to continue pressing the envelope in regard to its environmental goals. For example, Summers reports that the company has recycled and reused more than 1.1 billion liters of wastewater since 2013. Furthermore, 16 operations and support facilities have achieved 100-percent zero-waste-to-landfill status. 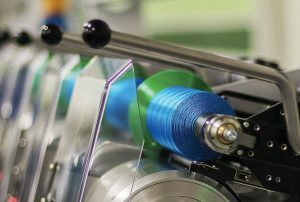 Overall, from 2006 to 2016, the company reduced its worldwide greenhouse gas intensity by 6 percent and reduced its global power consumption by 10 percent when measured in kilowatts per kilogram of thread manufactured. Forty-four percent of the fuels used to create steam at A&E dyeing operations were renewable and carbon neutral in 2016. Another organization that has a long history of conservation and recycling is the Humboldt, Tennessee-based Jones Family of Companies. 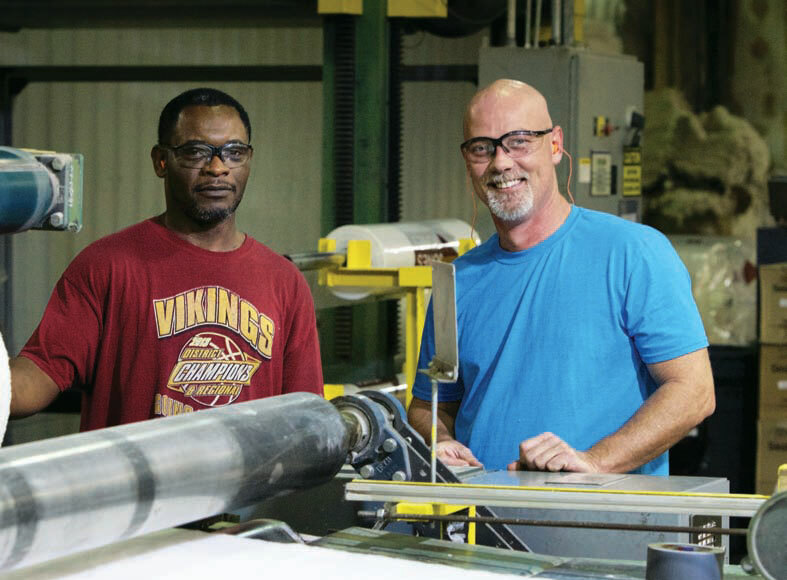 “We have developed many products with sustainable principles as the blueprint for product differentiation and performance efficacy,” said Patrick Owens, vice president, strategic marketing, Nonwovens. harvest plants and textile waste. Founded in 1936, the company is a family-owned business comprised of Jones Yarn and Jones Nonwovens. The yarn business combines natural and man-made fibers — including recycled textile by-products — into yarns that are used in floor care tools like mops. The nonwovens side of the business produces nonwoven materials from natural fibers including reclaimed cotton, wool, jute and hemp. In addition to packaging, these fibers can be used in such applications as cotton batting for fire barriers, mattress insulation and other thermal insulation applications. The company recently announced a doubling of capacity at its Jones Nonwovens plant located in North Las Vegas, Nevada. The expansion was in part to meet market needs for thicker and more resilient sustainable and natural material products for mattresses, which are beginning to replace synthetic components and foam. Jones Nonwovens has recently also been making headlines for its new biodegradable Synchronicity packaging, a more environmentally friendly option to the polystyrene foam common in a lot of cold packaging. Owens continued: “Our first focus has been on packaging, particularly thermal-insulated packaging. This is especially timely as a rise in e-commerce has necessitated the use of a lot of packaging materials.” He cited home grocery and food orders as examples. “Consumers ordering these perishable meals once or twice a week have begun to build up a lot of waste,” Owens said. Owens also said Jones Nonwovens has joined the Sustainable Packaging Coalition (SPC), an initiative that brings together companies, educational institutions and government agencies involved with the packaging supply chain. Goals of the SPC include a collective development of resources and the implementation of packaging solutions. “We see this as a great opportunity to work with like-minded companies as we strive to develop our efforts in the world of sustainable packaging,” Owens said.